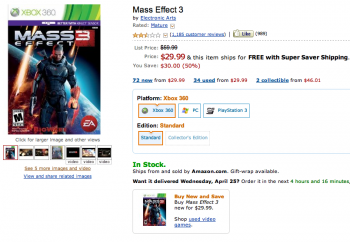 Amazon chops the cost of BioWare's latest in half for a day. Earth is burning. Striking from beyond known space, a race of terrifying machines has begun its destruction of the human race. And for only $29.99 you can get in the middle of it! For a limited time only (as in today only), Amazon is allowing players to fight all of the Reapers for only half of the dollars! If you don't already own the game, or did own it once, but then decided sell it on eBay because you were kinda mad about that whole ending thing, but now you sort of miss it if for no other reason then the fact that your buddies keep talking about how much they like the coop multiplayer mode that you can't enjoy with them because you somewhat hastily decided to cash in on your narrative standards, then this deal is for you! Amazon has been known for some pretty ridiculous videogame deals in its day, but most of the deep discounts have traditionally been for downloadable titles only. Some people may dig on that, but it leaves the console junkies among us out to dry. Thankfully, this 24-hour deal on Mass Effect 3 expands to PC and Xbox 360/PS3. If Mass Effect isn't your thing, Amazon also has some pretty great timed deals rolling out on an hourly basis. Most of it seems to be PlayStation Move related, but you may find a few surprises if you look through. You can pick up a new copy of Mass Effect 3 here for $29.99, or sniff around today's other videogame deals here.